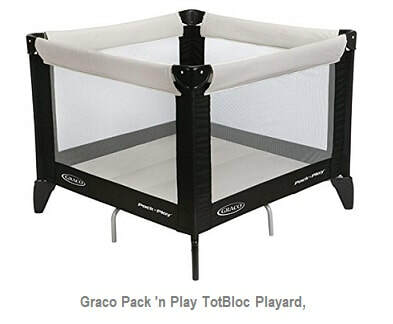 Compare Playpens (Playards): Graco Pack 'N Play or Joovy Room2? Babies grow fast! It doesn't take much time before they are able to crawl around the house making it quite difficult for the parents to keep them under their watchful eye. Playpens, also known as playards, were invented precisely to provide the toddler with an enclosed, safe, and pleasant environment for play time. ​Playards have evolved over time, and the best brands today come with features that keep the toddler both entertained and comfortable. In addition, they easily fold and can be carried anywhere you go. This becomes quite useful when you're visiting the grandparents, other relatives and friends, or when you're traveling and you need to keep the toddler under control in unfamiliar environments such as hotel rooms. It should be spacious enough for the baby to feel free and play comfortably. It should have a strong sturdy frame. The walls should both be transparent and meshed so that air can flow in from the sides, you can see what the baby is up to, and the baby does not feel confined. It should be quick and easy to set up and fold. Best playards can be installed and folded in less than a minute. It should have a soft mat or a mattress so the baby can rest or sleep when tired. It would be nice to have wheels so it can easily be moved around by just pulling. 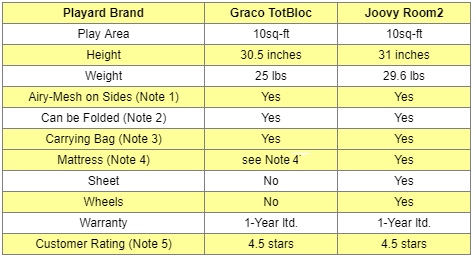 You will find below a comparison of the most popular two playards sold on Amazon, the Graco Pack 'N Play TotBloc and the Joovy Room2 to help you choose the one that will best suit your needs. Note that these are not just best sellers but have also received raving reviews from Amazon customers (average ratings of 4.5 stars each, out of 5 stars, at the time this article was written). Note 1: Airy mesh on four sides provides good ventilation, and the child does not feel confined. Note 2: Both brands can be quickly and easily set up and folded. Note 3: Te Graco TotBloc bag has a handle to carry, while the Joovy Room has shoulder straps (see picture). Note 4: The Graco come with a padded floor-mat, while the Joovy comes with a mattress and a 100% cotton sheet that slips right over it. Note 5: These are averages from Amazon reviews (maximum rating: 5 star). Note also that both playards offer additional colors. The available colors will be shown when you click the product images in the Amazon section below. So which playpen (playard) to buy? 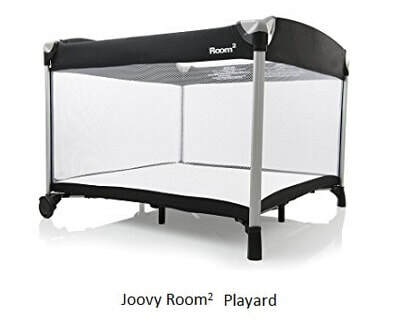 Even though both playpens have metallic frames, the Joovy Room2 has a frame made of steel and aluminum, and the material it's made of is luggage-grade 600-denier fabric. This explains why the Joovy is heavier even though both playards are about the same size. The Joovy is equipped with a pair of wheels and can easily be moved around. It also comes with a thick mattress and a 100% cotton sheet that is very soft and well made and that easily slips on the mattress so the baby can comfortably rest and sleep when tired. The Graco has no wheels and has a padded floor-mat. All these additional features explain why the Joovy is more expensive than the Graco. A final note on upkeep: Care for both playpens is very easy. You just need to use a damp cloth or a sponge with household soap to wipe all the various parts. Are you looking for a playard with a bassinet? If you are looking for a playpen with a bassinet, please check the following Joovy Room playard with bassinet that follows, the features of which are described below. When you click this product, you will be offered additional colors. Flip-away changing table with sturdy vinyl top for easy cleaning supports a baby up to 25 pounds. Full-size bassinet holds infant up to 15 pounds. Diaper organizer and giant side pocket provide plenty of storage. Waterproof cotton fitted sheet and travel bag included, additional sheets sold separately. Two wheels for easy moving around your home.